Welcome to the Teacher Thank You Gifts Blog Hop ! You should have just come from Cyndie’s blog. If you’re just joining us and wish to start from the beginning, please hop on over to Dena’s blog. Teacher Appreciation Week this year begins on May 7th and ends on May 11th. If you’re looking for some teacher thank you gift ideas, you’ve come to the right place! Each of the designers in today’s hop is sharing a wonderful gift idea for a teacher. We hope you have fun hopping with us while picking up some great ideas! 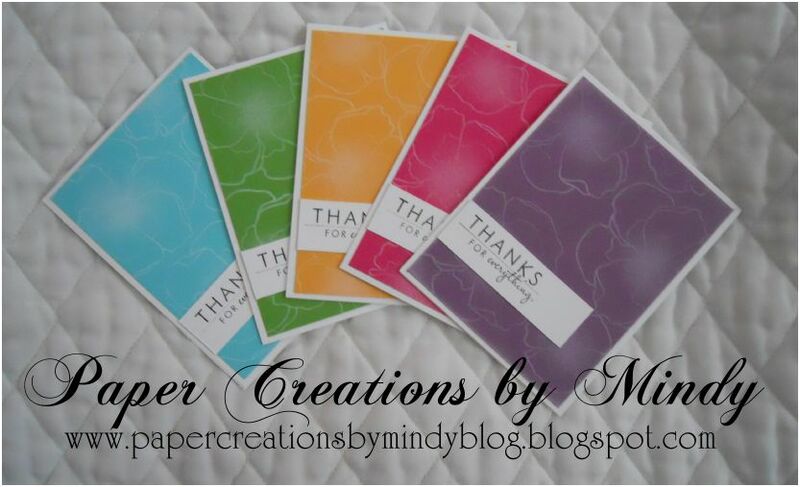 For my Thank You gift I made…… a Thank You card set. I just love these colors! They look so bright and cheery all spread out like this ! Each card measures 4 1/4 x 5 1/2. The colored pieces of cardstock are measured at 4 x 5 1/4, just enough to have the white border. My sentiment piece of cardstock is measured at 1 x 3 and I lined it up with the edge of the colored cardstock. Stamps, Ink, Paper is all from Papertrey Ink. If you’ve never tried their products before – you should! Their cardstock is fantastic! I believe it’s 110 lb cardstock so it’s great for making gift boxes ect. Real sturdy cardstock. I’ve randomly stamped violets on the colored cardstock and then took a sponge wedge, inked with Fresh Snow Ink and lightly used a circular motion in the inside of each flower. It just gives them a little ….Pop! Here is the entire line-up if needed. Mindy : http://papercreationsbymindyblog.blogspot.com/ You are HERE! For today’s blog candy I am offering a $10 gift certificate for a brand-new online scrapbooking company. To be eligible for the $10 gift certificate all you need to do is leave me a comment – that’s it! Please read below for more information about Ginger Snap Scraps. at home mom, Cori Wagner. Cricut cartridges are $35 and under all the time! always free, as a thank you for your service to our country. BUT…. FOR MY READERS TODAY…..
Cori would like to offer all of you free shipping to her store! order-good for US and Canada! Announcement! Paper Piecings for Sale! wonderful teacher gift and I love the way you've inked the middle of your stamped flowers…It really is pretty! Love your cards. Thanks for the inspiration on how to ink up your stamped designs. 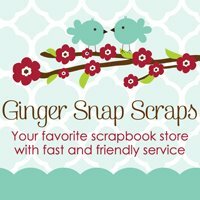 I also LOVE how at the Ginger Snaps Scraps has free shipping for military…. Great little set of cards. As a teacher, I promise you any teacher would love to receive these. Adorable Set of Cards!Love the Sweet Colors!TFS New Follower and so happy! Love your thank you cards! It's simple and sweet! Also thank you for the free shipping code! That always helps! Pretty thank you cards! LOVE the bright colors! I've given packs of handmade cards as teacher gifts too! Love the colors you chose. Hi, Mindy! I LOVE this card set! I'm sure any teacher would love this and make use of it! The colors are so pretty, and I just LOVE the stamped flowers. I'll have to try that trick with the Fresh Snow ink in the centers, too! Very, very pretty! Thanks so much for joining my hop!